​Broadly speaking, my research explores communication about politics, education, and activism. As a humanities-based scholar, my goal is to better understand how individuals and groups use argumentation and debate to negotiate identity, power, and social difference. As a feminist scholar, I pay particular attention to how gender, race, class, sexuality, and memory shape the rhetorical strategies of historically marginalized groups. My research has appeared in academic journals such as the Quarterly Journal of Speech, Rhetoric Society Quarterly, Women's Studies in Communication, Argumentation and Advocacy, and Communication and Critical/Cultural Studies. A full ﻿CV ﻿is available on my departmental page. 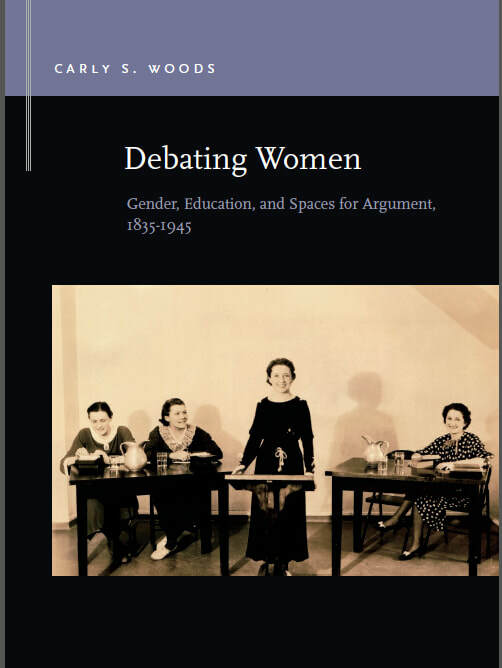 My first book, Debating Women: Gender, Education, and Spaces for Argument, 1835-1945, is now available from Michigan State University Press (Rhetoric and Public Affairs series, 2018). Spanning a historical period that begins with their exclusion from university debates and continues through their participation in co-educational intercollegiate competitions, Debating Women highlights the crucial role that debating organizations played as nineteenth and twentieth century women sought to access the fruits of higher education in the United States and United Kingdom. Chapters focus on debating women at Oberlin College in Ohio, at the University of Pittsburgh and Penn State University in Pennsylvania, in the Ladies' Edinburgh Debating Society in Scotland, and on the first British women's debating tour of the United States. Despite various obstacles, these debaters transformed forests, parlors, dining rooms, ocean liners, classrooms, auditoriums, and prisons into vibrant spaces for ritual argument. There, they not only learned to speak eloquently and argue persuasively: they used debate to establish a legacy, explore difference, engage in intercultural encounter, and articulate themselves as citizens. These debaters engaged with the issues of the day, often performing, questioning, and occasionally refining norms of gender, race, class, and nation. In tracing their involvement in an activity at the heart of civic culture, debating women have much to teach us about the ongoing potential for debate to move arguments, ideas, and people to new spaces. ​My ongoing research projects focus on feminist rhetorical history, public memory, genius, and the politician Barbara Jordan.